Silk and nylon threads may break if the maximum tension is exceeded during knotting.Griffin High Performance Bead Cord is almost unbreakable - even threads with the smallest diameters. Griffin High Performance consists of high-tech fibres with a specially dense molecular structure. Its tensile strength is unbelievable: In fact even the thread with the smallest diameter cannot be torn apart by hand. These fibres are 15 times stronger than steel, which makes them the strongest fibres in the world. The result is absolute security for your jewelry. Griffin High Performance is however as soft as silk, flexible and excellent to work with. Since it does not stretch, necklaces and chokers will not elongate over time. 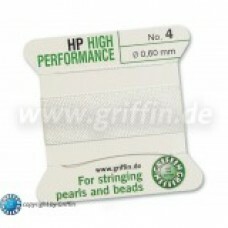 Griffin High Performance is only available in white but 10 different thread sizes. Each card contains two metres of thread with one or two stainless steel needles attached. As this high-tech solution is extremely robust and incredibly tear-proof, we would especially recommend Griffin High Performance for pearls, beads and stones with small drilled holes.